H5C’s Memories with Dad Contest Congratulations Winners! 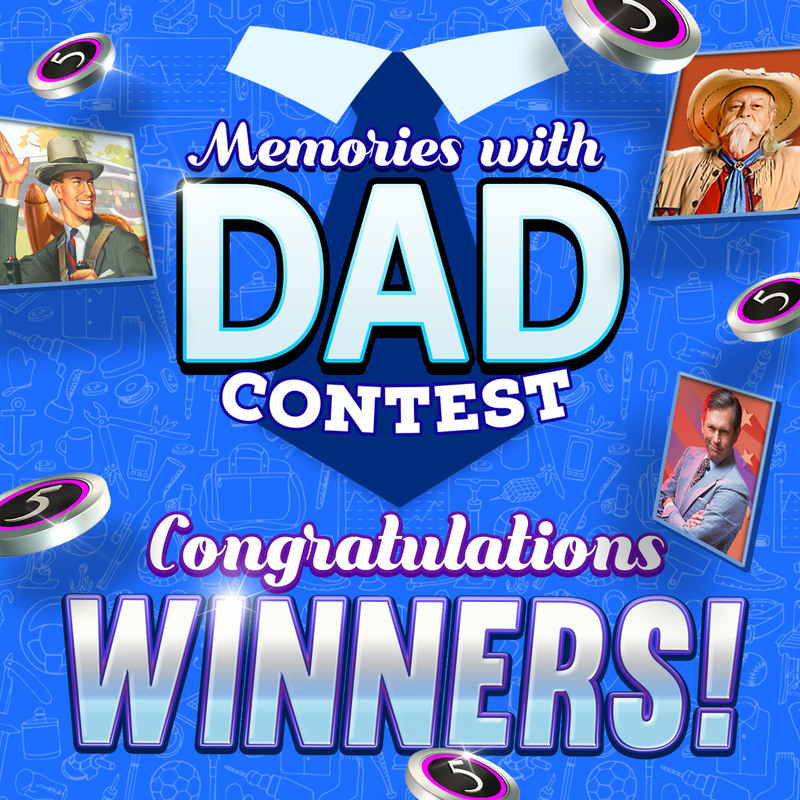 Father’s Day is this weekend and here at High 5 Casino we wanted to do something special to honor all the great Dads out there! On Wednesday, June 7th we invited players to tell us about their favorite memory with dad. Did he teach you how to fish, a cool magic trick or maybe he taught you how to ride a bike? Whatever it may be, we wanted to hear about it! 100 winners were picked and have been awarded with 200k H5C Coins! Congratulations Winners! My Dad Was Awesome- My dad was a great provider and a family man. He didn’t say much but had a keen way of getting his point across. We use to say he could chastise you and you didn’t even know it. Love my dad. Rest in Heaven! Back home from Desert Storm War 1991 – My brother and I were 3 yrs old and 1 year old. Dad got called away to Iraq in 1990 just after my little brother was born. Mom and me and Chris were left behind to hold it all together while our Dad who was in the Army went to do his job. He made us all so proud! I have a picture of the day he marched into the airport hanger with his unit and they were dismissed and he grabbed my brother and me up and held us both so tight. He always helps others and has a heart of gold! Best Dad ever! Make sure to check if you are one of the 100 lucky winners today in the list below! All winners have received 200k Free High 5 Casino Coins in their casino lobby! Congratulations to you all! What kind contest would you like to see at High 5 Casino? Comment in the conversation bubble located on the top right of the blog post to let us know! This entry was posted in H5C Contest, High 5 Casino, High 5 Games, High 5 Moments and tagged Android, App Store, Apple, Facebook, Free Games, Game Spotlight, High 5 Casino, High 5 Casino Mobile, High 5 Games, iOS, iPad, iPads, iPhone, iPhones, Player Spotlight, slots, social gaming by hoothigh5. Bookmark the permalink.